Joanne is the Resource Protection and Permit Coordinator for Florida Keys National Marine Sanctuary where she reviews applications for coral reef research. Over 75 scientific investigations per year in the sanctuary are supported by Florida Keys National Marine Sanctuary permits. Joanne also reviews nearshore construction projects proposed within sanctuary waters to ensure they are compatible with resource protection. Joanne holds a Bachelor of Science in Biology and a Master of Arts in Teaching from the University of New Hampshire. 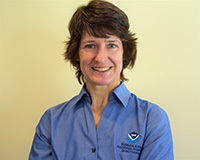 Prior to working for Florida Keys National Marine Sanctuary, Joanne taught biology at the high-school level and managed a marine research facility. Joanne brought her background in marine science, management, and education to the sanctuary in 1997. In 2001, Joanne received the NOAA Administrator’s Award for her work to establish the Tortugas Ecological Reserve. Joanne’s favorite snorkeling spots are the nearshore hardbottom habitats of the sanctuary.